Saturday we had pouring rain and a lot of wind and there was quite a bit of debris all over the steep road when He-Man and I went for a “stretch our legs” walk Sunday morning. I like the design, and how they carried that into the glass panels. I really like the Lions guarding the doors. I don’t care for the door knocker on the door. I find it distracting, and only one door has a knob. I would have two. That’s just me. Maybe they were going for a Yin-Yang thing? Pretty unique isn’t it. Thank you so much for the comment and visit! Do you have to go far to see the Grandkids or are they local? I hope local after all the driving you’ve just done. The second door is unique, Deborah. It’s fun to come across something so different. Like your doors in this blog. The first door is guarded by Buddhist statues which seem to say, stay calm in the eye of the storm. The second door is guarded by the lions which appear to say to the storm, not on my watch! Both of these are gorgeous entrance-ways. I would be thrilled with either, although I am partial to the 2nd one with the rounded construction. There is so much square-ness in buildings, adding rounded features seems so attractive to me. Thank you so much Joanne! The roundness is what caught my eye. It’s very unique. The second door is interesting t me, because I know this is a custom made door, and the owner had to insist and convince the carpenter what and how they wanted it:) – but both are lovely captures! Sorry for getting back so late – this has been a week full of distractions! Am surprised you went out of your way to go Jackson to take pics! That is where I do half of my groceries. For the other half we travel to Folsom, because we are addicted to Trader Joe (grin). In that sense we were spoiled having lived in Orange county. Another day we went back so I could catch the front of this church. Kind of luxurious compared to the mismatched houses around it ! I really liked Jackson, and hope to get back for another Photo-walk. I photographed the inside of the church too. It’s lovely inside. I don’t know if I’ve ever blogged about it. I haven’t ever published my images from Preston Castle. They’ve been marinating on my hard drive since 2010 when I was there last. It’s been cold here too. It’s supposed to start raining again today and tomorrow too. What are the rgeneral ules in. 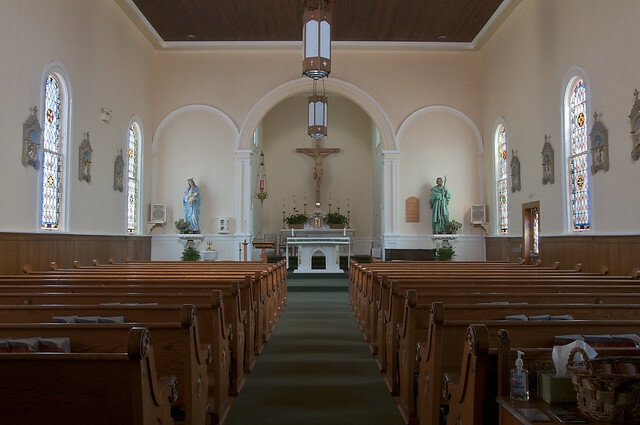 America about photographing churches from the inside? In Eur. It may be forbidden, especially when a service is going on. With museums too, with you are asked to put all your luggage in bins at the front. In England and France I was allowed to photograph the inside of the Cathedrals I visited, but no flash or tripods were allowed. Here I’ve been allowed to photograph the inside if I stayed toward the back, didn’t block the aisle, and there wasn’t a service going on. I have been allowed to use my tripod in all of them that I’ve tried to photograph except Mission San Capistrano. There I could have taken a Monopod, but I didn’t have it with me. I want to rephotograph a chapel there. There’s usually someone about to tell you how long you can stay. Lovely. I always love your take on this! I love the doors! Unusual and interesting. I agree with you about the semi-symmetry attempt with the knob and knocker — it is distracting. Now those are some serious doors and it looks like there’s a slate tile roof on that first one – nice! I like the top door, even with the mess. I do like that they carried the design of the circular door into the glass, but I’m not really a fan of the design. It is a nice photo though. I always have trouble with the light on deeply recessed doors, but you managed a very nice balance. Good job Deborah! Thank you Dan! It’s an interesting design. Not one I’ve noticed often. Shooting into the shadows…here’s a tip. Your first shot will likely be shot at what the camera thinks is the “right” exposure. Keep it! Take another shot but this time overexpose by a stop. You’ll open up the shadows, and the highlights can be tamed when you develop the image. Do look at the image in playback before leaving the scene to make sure opening up the exposure by 1 stop is enough. Sometimes if the shadows are deep you’ll need to open it up by 2 stops or more. Unfortunately, our cameras while getting better can’t see the dynamic range our eyes can. Blending frames or compositing is the only option, sometimes. Hope this helps! Thanks for the advice. I have to get more comfortable shooting in manual mode with this camera. My daughter has had this discussion with me several times. I have one door that I would like to revisit and spend some time getting a better photo, because it just didn’t come out the way I saw it. On top of everything else, it was a black door. Shooting in Manual Priority is easiest for me b/c I’m in control of everything, and it’s how I learned to make photos. If you gave yourself an entire day of only shooting in Manual Priority you’d be a lot more comfortable with it, and maybe even mastered! Since you already know how it sees, and are familiar with the button layout, and menus. 🙂 I think we have too. In any case I think Faith is right about shooting in Manual Priority.